Is This the Ultimate Card Battle Game? 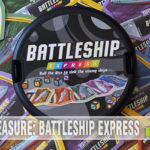 Home / Recreation / Games / Is This the Ultimate Card Battle Game? We all have our favorite types of games. As you know, mine are typically abstract games. Some might prefer role-playing titles like Dungeons & Dragons or Pathfinder. And we cannot ignore the immense popularity of decades-spanning card battle game, Magic the Gathering. We have a good friend that played MtG for many years and recently sold his collection to focus more on board games. 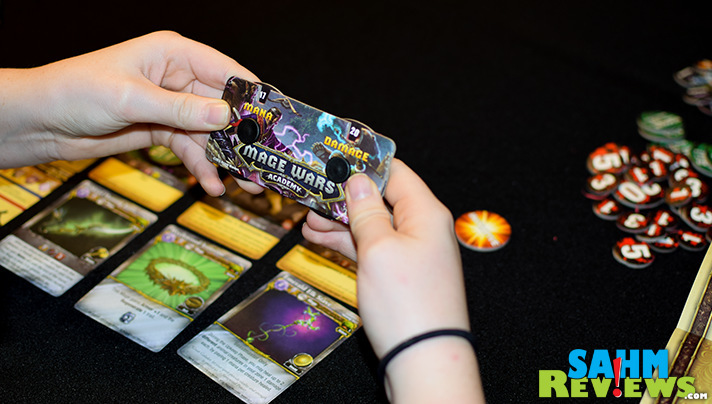 But he still has that itch to play head-to-head in battle and has proudly exclaimed he’s found his new favorite – Mage Wars Arena by Arcane Wonders. I’ve always been on the lookout for games my girls can play on their own and only require two people. 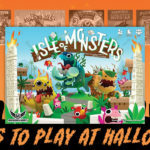 We’ve tried Dice Masters, Castle Assault, Pokemon and more. Of those three, Castle Assault made my wallet the happiest, with the others requiring the purchase of additional packs and sets over time. But something was still missing, and that was growth. Sure, you could upgrade your characters, but once you did you couldn’t return. And you were still hampered by the luck of the draw. So we began looking at my friend’s favorite and discovered a new version, Mage Wars Academy. In the original game of Mage Wars Arena, each person controls a mage and moves around an included board. Positioning is nearly as important as the spells you choose. Mage Wars Academy simplifies this by removing the board requirement leaving you with a head-to-head spellcasting battle. You can almost consider Mage Wars Academy a training version for Arena. Thematically it makes sense – before you can become a full mage you must first learn how by going to school (academy)! Each player selects one of the included starting mages, either a full-on wizard or a beastmaster, with more slated for release by early summer. Each has their own strengths and weaknesses along with a custom spellbook. This is where Mage Wars Academy sets itself apart from other card battle titles. In most games of this genre, no matter how well you play or how strong your character is, you are still hampered by the randomness of a shuffle. Each turn you would draw a predetermined number of cards and play from those. 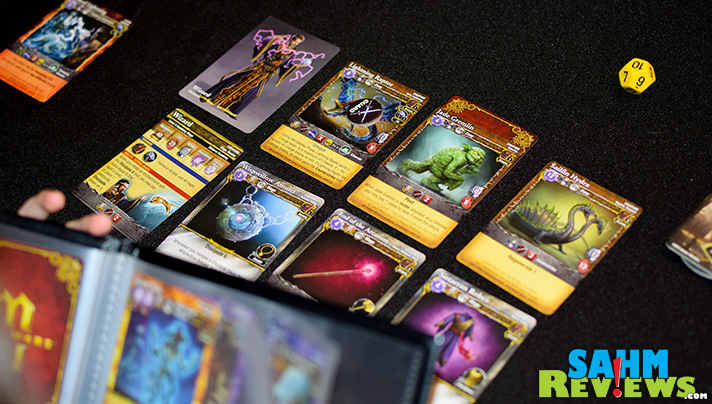 In Mage Wars Academy ALL of your spells and abilities are available to you at the same time. 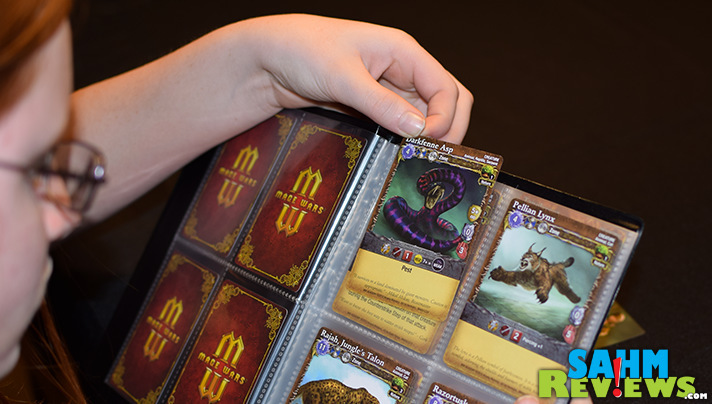 Included is a 10-pocket spellbook holding up to 80 cards back-to-back. Instead of hoping for a particular spell to be drawn to counter your opponent, there it is waiting for you to cast at any time. The rest of the game play is similar to what you would expect from any good card battle. Each mage can cast spells, summon additional creatures to fight by their side, equip magical armaments and add enchantments that make themselves or their allies more powerful. 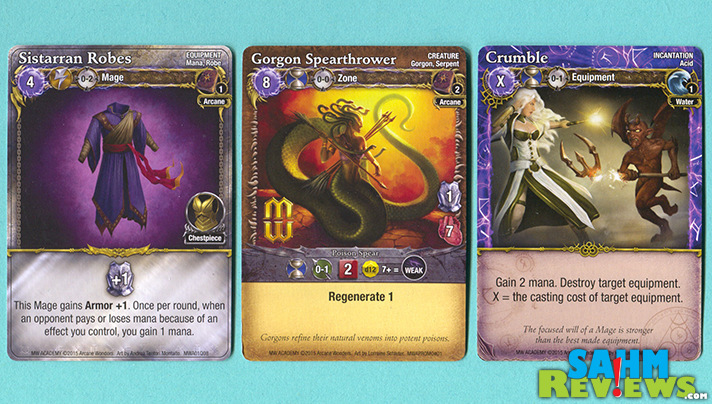 During each round, every mage and summoned creature is allowed to perform an action (attack, guard or cast a spell). Attacks can be performed against your opponent or any of their summoned team, guarding orders your summoned allies to defend you at all costs (your opponent must attack them first before attacking you). Spells are only cast by a mage and up to two can be cast per round (a regular one mentioned above or a quick-cast version). Each round you are awarded mana in which to spend on these actions. Mana and your health are tracked on the included status trackers. Mana carries over from round to round so there is no need to feel that you must spend it all on one turn. Save some and build up for the next round! Every card is clearly detailed with abilities (defense, attack strength, life, etc.) and can vary wildly from type to type. This allows for an almost unlimited number of tactics to employ. Maybe you’d like to just rush in and cast attack spells all the time. Or you want to play defense and summon a lot of minions to fight for you. Maybe one creature is plenty, but you’ll enchant him so he’s more powerful than all the others. With an entire book of spells at your disposal, no two games should be remotely similar. Arcane Wonders has put together a fantastic series of game play tutorials for the beginner or veteran looking for a refresher course. We found them to be invaluable to learning how to play and would recommend their viewing before reading the official rule book. This will make actually going through the written rules much easier and less time-consuming! 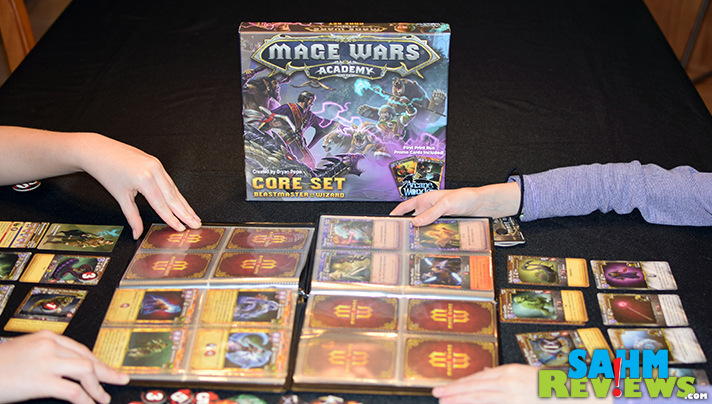 But what do we like most about Mage Wars Academy? Knowing that once we’ve played it a number of times there will be more to do. 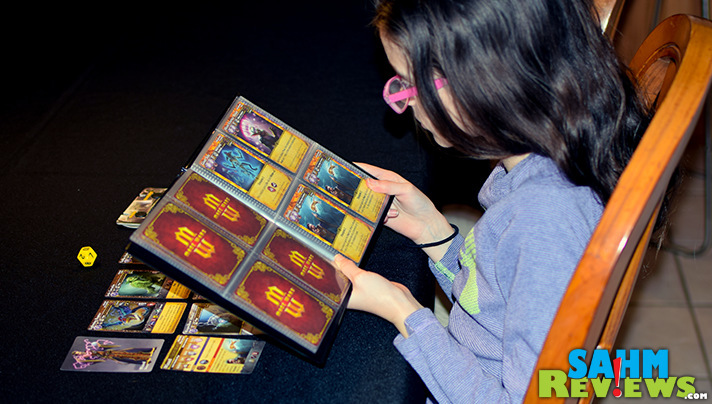 You begin with a starter spellbook, then once you have mastered the rules, are invited to build you own custom book using any of the additional 74 cards included in the base game. Your only limitation is set by the character you play, with the maximum number of spell points printed on your character cards. You can decide to have many weaker spells or go all-out and only have a few extra-powerful incantations. As an added bonus, all Academy cards are completely compatible with its big brother, Arena, meaning once you’re ready to move on to harder battles your Academy investment still pays off! And at a price well under $30, Mage Wars Academy looks to be the last card battle game we’ll need (of course until we’re ready for Arena)! I can’t express enough good about this game and am hard-pressed to find any faults. If I had to relay just one, it is that the box is so jammed-packed it can be difficult to get everything back into it! 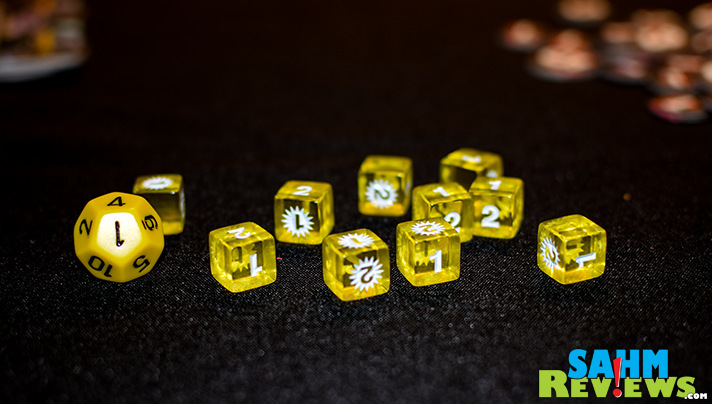 And I neglected to mention, the dice we used are an upgrade to the included set – maybe I will be spending some extra money after all! According to the rules in Arena, the cards can be used in Academy as-is. I admit, I haven’t played Arena, but do see the range notations/etc. on the cards that are to be ignored in Arena. I think many look at Arena as a mini-expansion for Academy? Sounds like a great game for teens and possibly tweens. My husband likes strategy games so I bet he would enjoy this too… perhaps for his birthday that is coming up soon. I love seeing all of your game reviews! “A family that plays together, stays together!” Our girls love playing games with us and it’s one of our favorite ways to spend time with each other! It’s always the dice and the number crunching that makes me feel uneasy about card games like these, but I do love the strategy and the fantasy aspect. It looks like Arcane Wonders really has gone above and beyond to offer the beginning player plenty of tools to get the hang of it. I would have loved trying this with my sister, growing up! This looks a lot like a game my college kids played online called RetroMUD. Looks like a fun game! My son is still too young for this, but it still sounds pretty cool. This looks so fun! Cant wait for my copy to arrive!! Haven’t heard of this game, yet, but I’m sure it’s one my teens will be asking for soon! 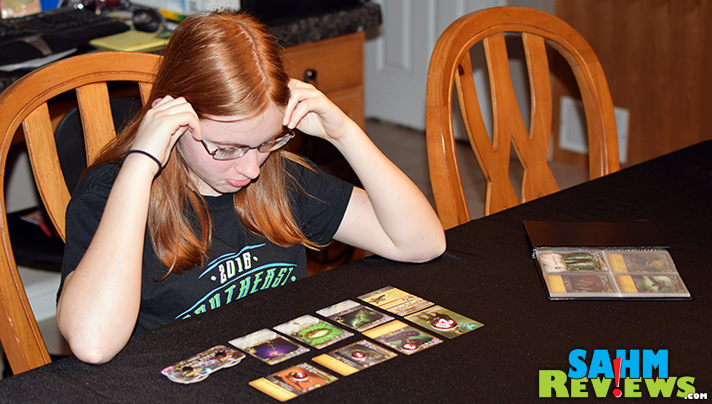 We love card and strategy games and as a mom, I’m happy to indulge them as the game play is terrific for reinforcing things like logic skills. Awesomeness all around! There are some geeky people in my life who will be VERY happy to hear about this game. I’ll have to forward this link on to them. Thanks for sharing this. I know some teen boys in our famiy that would love this. Thanks for the great info and picture photos! With a slight age gap in my kids, it’s good for us to have games where luck is part of it. This sounds like a great choice for our family. With a glowing review like this, I think we need to get this and give it a go. Thanks for this! 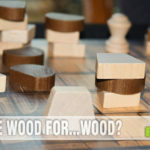 That doesn’t look like a game I’d play but one my husband & kids would love! I’ll have to locate it for Valentine’s Day or Easter! I think the boys are a tad young for this game, but the price is great and it sounds like the girls enjoyed it! Never to young to get them started, Jennifer! Our girls play games well above what people expect they should be able to play. We are fortunate to have a weekly board game meetup that we’re able to take the kids to. There are always people who are willing to teach new games – to kids as well as adults – so we are constantly learning new ones. 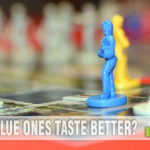 It’s been so well received in our area that the libraries are doing board game meetups a few times a month as are some of the local game stores. You should see if there’s something like that in your area, Nicole. This game looks like a lot of fun. I know my husband and son would both think this is cool and want to play. My guy friends back in high school would have loved this game. They were super into card games. This looks like an interesting game. I think older kids would have a blast playing it!